JL Audio during CES announced new C7 audiophile components designed to work with aftermarket systems that use a digital signal processor, such as the JL Audio TwK. And at the other end of the spectrum, JL Audio gave a glimpse of new C1 entry level speakers. The C7 project was led by JL Audio’s CEO himself, Lucio Proni who is also the company’s Chief Engineer. The line uses audiophile grade material including a corundum ceramic-coated diaphragm for the C7 tweeter. 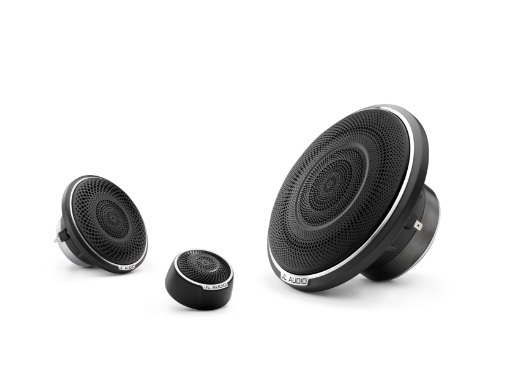 The C7’s component woofer’s dust cap went through ten prototype generations, said JL Audio. The speakers are designed to complement the JL Audio W6v3 and W7AE subwoofers. C7 models ship in May and include the 6.5-inch C7-650cw at $449.99/each, the 3.5 inch C7-350cm $349.99/each and the 1-inch C7-100ct at $199.99/each. 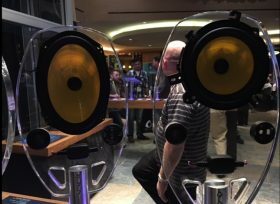 At the low end, JL Audio showed at its Vegas suite during CES, new C1 entry level component and coaxial speakers. They are designed as OEM replacement speakers with mounting rings for easy integration into vehicles. JL Audio displayed 6.5-inch and 6 x 9 inch C1 components to be part of a full line that will ship by early in the second quarter this year. Pricing has not been announced but the C1 will fall below current C2 speakers which range in price from $89 to $250. Sold individually, with a cast-alloy grille tray and a specially perforated steel grille insert. Sold individually, with flush and surface mounting fixtures and hardware. One tweeter protection capacitor is also included.